How to spot fake Rolex Daytona watch, to recognize counterfeit and identify authentic Rolex Daytona | iSpotFake. Do you? ​Rolex are meticulous with their attention to detail. Quality control amongst Rolex staff is paramount. Lettering and print should appear perfect as Rolex wouldn't sign off a watch that was anything less. Eyebrows should definitely be raised if there is any discolouration or inconsistency within the lettering itself. The spacing and font should be exact and if there is any lettering that is bubbled or crooked at all, then it is most definitely a fake. Rolex Daytona does not have a date window. Any models containing this feature are absolutely replicas. 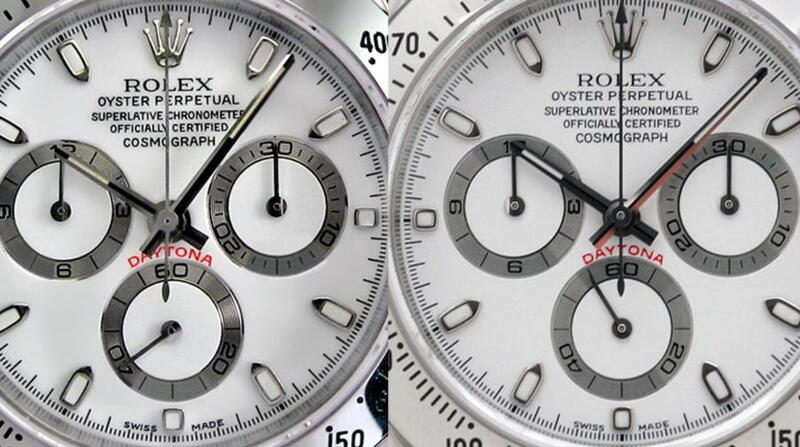 One of the simplest ways to spot a fake Daytona is to see if it has a skeleton caseback. This feature allows you to see the watch's inner mechanism and genuine Rolex watches don't have them. However, there are always engraving on the sides of the case at the lugs. One side will display the model number and the other will have the serial number. If these engravings are crooked or missing, then it's a fake. ​Genuine Daytonas have a 3D hologram-encoded sticker on the caseback. It has the watch's serial number in gold lettering although for post-2002 models, the lettering will be in black, not gold and there will be a Rolex crown above it. Although fakes may have a sticker, it usually isn't a hologram and won't change when viewed from different angles. It goes without saying that the model number on the watch should match the material. So if the model number refers to 18K white gold but the watch is stainless steel, then it's clearly a fake. Remember that to see the model number you need to remove the caseback from the bracelet and look at the centre of the lugs. On real Rolexes, the serial and case reference numbers are engraved in such a way that they feature very fine lines which catch the light, similar to a diamond cut edge. Most fake Rolexes will have a sandy 'acid etched' appearance. Counterfeiters will tend to use the same numbers and they'll usually be too close together. ​Rolex have been putting micro etched logos on their watches since 2002 – it shouldn't be present in earlier models. It will be at the 6 o'clock position and because it's so tiny it is hard to see with the naked eye, but it will be just below the 6 o'clock marker under where it says Swiss made. The movement should be a mechanical self-winding movement and if it isn't, chances are it will be a Chinese replica. 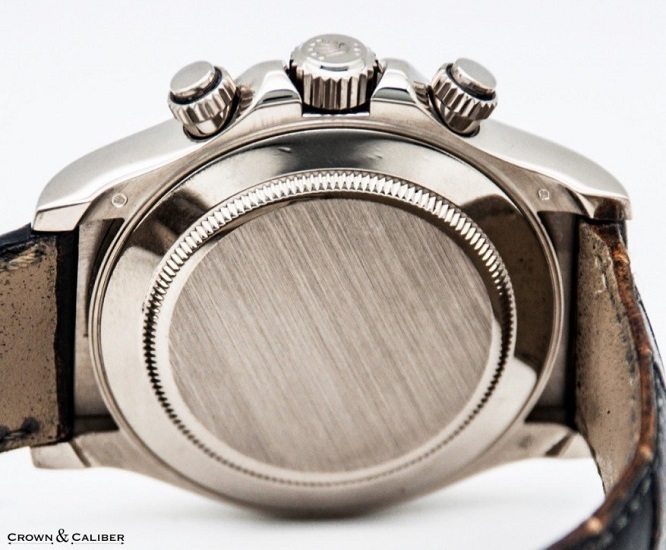 If you are unsure in any way, get a jeweller to remove the caseback so you can see the inside. Turn the watch over and look for a discreet clasp with a Rolex crown symbol on the watchband. If there is no crown or clasp visible, the watch is a replica. 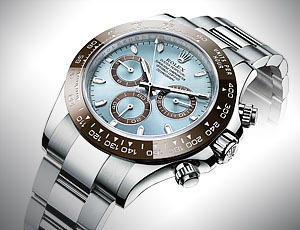 ​It is a common misconception that all Rolex Daytonas and Rolexes in general have a sweeping hand. You can find Rolex Daytonas with a second hand that ticks, just as you can find replicas with a sweeping hand. For this reason, it's not a fool-proof method of authenticating a watch. If you put the Daytona up to your ear and you can hear the ticking, it's most likely a replica. For genuine Daytonas, the sound should be almost inaudible. ​Any Rolex watch will be made from high quality materials and should have some weight to it. If it's lighter than you expect, it will most likely be a Chinese replica made of an inferior material. You should always test the pushers to see if the chronograph function works. If they don't, it may well be a fake. Daytonas have a triplock system to withstand underwater depths to prevent water from entering the case. The lack of this system is an easy way to authenticate a watch. If you pull out the crown there should be a black rubber gasket visible at the end of it – that's the triplock system. Obviously price is a dead giveaway when purchasing a Daytona as mainstream models won't deviate wildly from the RRP. Try to always buy your Daytona with the papers intact.